His second bass ever! Had to share. The brag’s keep rollin’ in through our iFish Apps and I love sharing them! Here’s one out of Lakepoint Resort in Illinois that came through this weekend. So far in our iFish Series of Apps we have 4 Canadian & 17 American apps. We’re happy and proud to say ALL apps are now available for both iOS and Android! This morning’s Fishing Wire featured a write-up letting everyone know this exciting news! Get the app today and join in on all the fun! Read the whole story here. Do you receive The Fishing Wire daily to your inbox? If not, you should definitely sign up – it ROCKS. Useful information for anglers nationwide – oh and this morning we were featured in it! We’ve just released 3 new iFish state-specific apps into the App Store & this awesome daily newsletter highlights that! Check it out and read the full story here. Check out this 32 lb Carp out of Irondequoit Bay, Lake Ontario, NY! Thanks to Dave Fenlon for using the brag feature attached to the CatchLog! 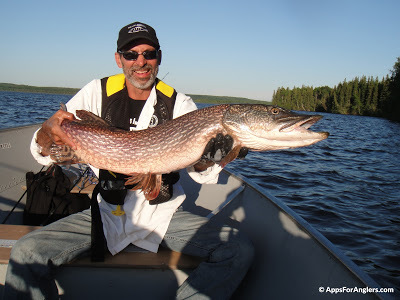 Recently, Randy, President of AppsForAnglers.com and creator of the iFish Series of Apps took a trip to the beautiful Winefred Lake Lodge in Northern Alberta. The weather was gorgeous, the accommodation was flawless and most importantly, the fish were biting! Here’s a link to the Winefred Lake Lodge blog, which includes photos and details of Randy’s trip. Don’t forget to check out the Winefred Lake Lodge website for info on this beautiful wilderness resort! AppsForAnglers.com released 11 more state specific fishing apps into the Google Play Store, making the entire iFish Series of Apps thus far available for both iOS and Android. iFish Alabama, California, Georgia, Illinois, Kentucky, Michigan, Missouri, Ohio, Pennsylvania, Tennessee and Wisconsin are all now available for Android anglers, giving an all-in-one app for freshwater fishing. Get access to a variety of details on thousands of local lakes and enjoy interacting with other fishermen through live lake reports and marking your favorite HotSpots.